I've just build myself a cheap static grass applicator. While I realise that it is probably not as good as a commercial product like that of Noch, it is also more than 20 times cheaper. 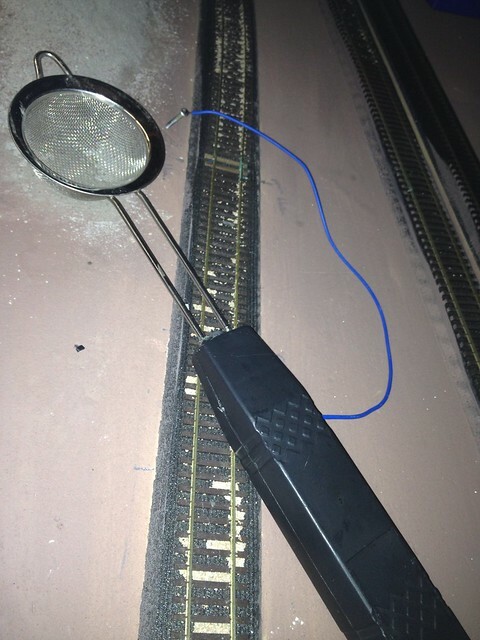 I used the electronics and handle from an old electric fly swatter, and a metal tea strainer. I opened the fly swatter cut the wires leading to the 'swatter part', soldered new wires to the circuit board , one of which onto the tea strainer, and one longer lead onto a small spike/screw. I used a few bits of carpet underlay(the green tiles) in the end of the handle to clamp the tea strainer , and filled up all the gaps with hot glue, then put the assembly back together. After the glue had set, I ended up with a fairly sturdy construction. All in all, under 30 minutes work. So do be careful. This one runs of two AA batteries, and probably isn't deadly or could do much harm, it does 'tickle' in a nasty way, and one can never be too careful. Now that I built this applicator, I also would like to build a clone of the 'noch' grassmaster. The problem is getting hold of a 12VDC negative ion generator (not a star trek item...) , but seems to be very hard to come by in europe, does any one have any good sources in the UK or europe to obtain these items? Well, it turns out negative ion generators are very hard to come by, the two main sources being Oakley in Australia, and the Model Railroad Video's website of Joe Fugate, who also publishes the Model Railroad Hobbyist magazine (and probably get's them from Oakley) I ordered mine from him, as you can pay by paypal, so upon receipt, I shall make a grassmaster clone. 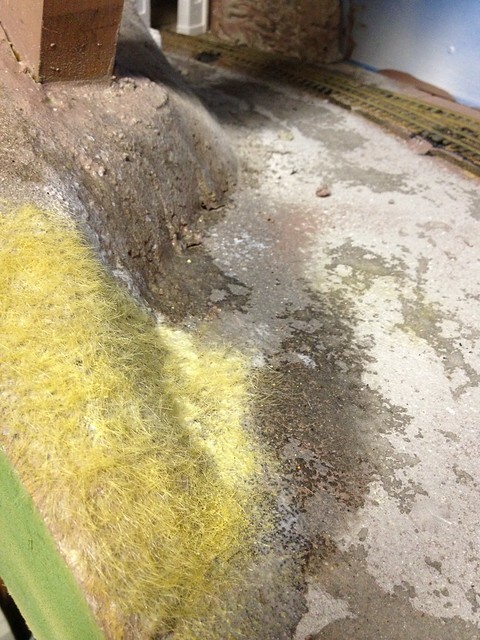 For now, I've tested my tea strainer version on a small section of my home layout, with results as in this picture. I have to say that part of the grass was deliberately flattened a bit, to resemble real wild grass a bit better.